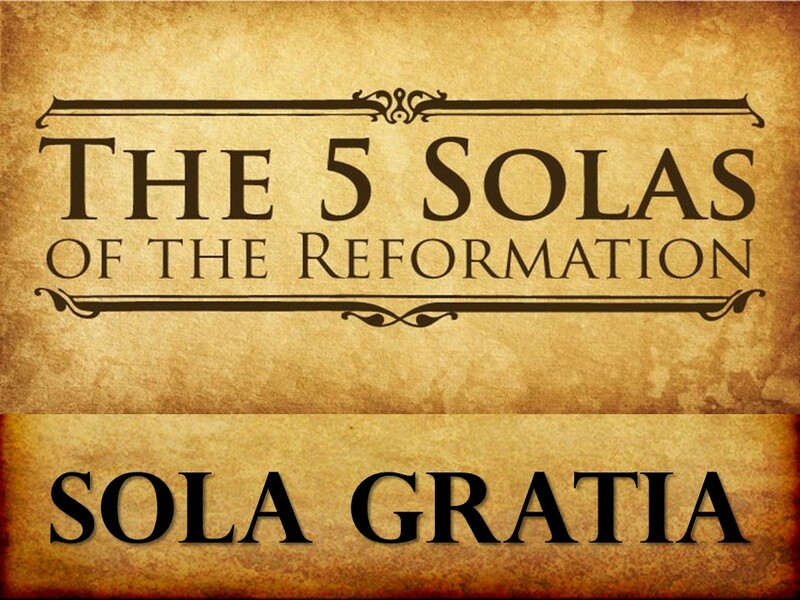 Nearing the 500th anniversary of the Protestant Reformation, we’re taking a few weeks to consider the 5 key slogans framing that amazing move of God reviving His church – the five “solas”. Last we looked at the slogan – Sola Scriptura. By it, the Reformers were calling the Church back to Scripture Alone as its final authority in faith and practice. It was not a call to abandon common sense, logic, history, science or the Church fathers, instead to say: where the Bible speaks, it speaks with absolute and final authority for the Church. No council, no organization, no individual has the right to override, ignore, twist, add to or take away from – Scripture. As God-breathed it stands in a place of singular supreme authority, especially over the conscience. When this fundamental concept the FORMAL concept is surrendered, then fallen men will inevitably seize that authority for themselves – and someone or something else takes the rightful place of God Himself. So it is, the second watchword of the Reformation grows directly out of this first one. Hence we encounter the very next phrase: Sola Gratia – by Grace Alone. Here, the Reformers were addressing the fact that over time, the Church had begun to redefine Scripture words and terms without reference to how the Bible uses them. And in so doing created a doctrine of salvation that directly contradicts the Bible’s own teaching. If the Church, or an individual, takes the right to themselves to re-define the words the Bible uses, the Bible can be made to say anything you want to make it say. And nowhere was this more true than when it came to the concept of grace. Sometimes, when Evangelicals critique the Romanist teaching on salvation, we oversimplify it and just say Rome teaches salvation by works apart from grace. This both inaccurate and unfair. By the time Luther and the others were calling for reform, the Church’s teaching on salvation HAD become pretty distorted, but it was so because of this issue of definitions. This will play a major role in the 3rd Sola when we look at Sola Fide as well. 1. One must co-operate in order to OBTAIN the grace of justification. 2. Christ’s satisfaction is not sufficient for our sin but guilt must still be met by temporal punishment either in this world or in Purgatory before the kingdom of Heaven can be opened to him. 3. And in both cases, the Roman Church said if one does not agree with them on this, they are not just wrong – but are “anathema” – under the judgment of God – cursed by Him and thus ex-communicated from the Church. I took that directly from the Vatican Website, neither an ancient nor outside source. In Luther’s day, what grace was and how it worked had been so redefined, that it bore very little resemblance to grace the way the Bible speaks of it. The bottom line issue is one of worthiness when it comes to salvation. The Reformers insisted that the Bible teaches that an individual’s worthiness could play no role in salvation, or salvation ceases to be a free gift. But the Roman view instead, if only in part, said and STILL says a person can MERIT for themselves and others – all the graces needed to attain eternal life. The worthiness of the individual to obtain eternal life is brought about by cooperating with the grace given at conversion. Sola Gratia: [The] Latin phrase meaning “grace alone” that expresses the Reformation* doctrine that salvation* is all of divine grace at every stage, from election* to glorification. * Inherent in this phrase is the truth that no merit* of man either before, at, or after his regeneration* by the Holy Spirit* contributes to his salvation. The only merit by which a sinner is saved is Christ’s merit. Thus, sola gratia is usually employed in conjunction with solo Christo, “in or by Christ alone,” to denote that it is solely in Christ and by virtue of His atoning work that men receive the saving grace of God. In other words, this comes down to the very Gospel we preach. A Gospel which announces the free gift of saving grace to all who will believe – versus a NON-Gospel, of entering into a man-made system of rites, rituals and regulations which help you become worthy. And just how worthy you have to be no one can tell you, because Purgatory is yet before you. So why does this cooperative view of making ourselves worthy fail so miserably? I want to advance 7 Biblical arguments. Because of how the Bible speaks of our lost condition. Our condition before we are saved is so dire, that God actually has to overcome our resistance to Him in order to save us – Not only are we not worthy, we are actually in opposition to His grace, until by grace, He overcomes it in us. Ephesians 2:1–22 “And you were dead in the trespasses and sin in which you once walked, following the course of this world, following the prince of the power of the air, the spirit that is now at work in the sons of disobedience— among whom we all once lived in the passions of our flesh, carrying out the desires of the body and the mind, and were by nature children of wrath, like the rest of mankind. 11 Therefore remember that at one time you Gentiles in the flesh, called “the uncircumcision” by what is called the circumcision, which is made in the flesh by hands— remember that you were at that time separated from Christ, alienated from the commonwealth of Israel and strangers to the covenants of promise, having no hope and without God in the world. 4 But God, being rich in mercy, because of the great love with which he loved us, even when we were dead in our trespasses, made us alive together with Christ—by grace you have been saved— and raised us up with him and seated us with him in the heavenly places in Christ Jesus, so that in the coming ages he might show the immeasurable riches of his grace in kindness toward us in Christ Jesus. For by grace you have been saved through faith. And this is not your own doing; it is the gift of God, not a result of works, so that no one may boast. For we are his workmanship, created in Christ Jesus for good works, which God prepared beforehand, that we should walk in them. Because it slanders Christ and says His blood is not sufficient to cleanse all our sins. Hebrews 10:1–14 For since the law has but a shadow of the good things to come instead of the true form of these realities, it can never, by the same sacrifices that are continually offered every year, make perfect those who draw near. Otherwise, would they not have ceased to be offered, since the worshipers, having once been cleansed, would no longer have any consciousness of sins? But in these sacrifices there is a reminder of sins every year. For it is impossible for the blood of bulls and goats to take away sins. Consequently, when Christ came into the world, he said, “Sacrifices and offerings you have not desired, but a body have you prepared for me; in burnt offerings and sin offerings you have taken no pleasure. Then I said, ‘Behold, I have come to do your will, O God, as it is written of me in the scroll of the book.’ ” When he said above, “You have neither desired nor taken pleasure in sacrifices and offerings and burnt offerings and sin offerings” (these are offered according to the law), then he added, “Behold, I have come to do your will.” He does away with the first in order to establish the second. And by that will we have been sanctified through the offering of the body of Jesus Christ once for all. And every priest stands daily at his service, offering repeatedly the same sacrifices, which can never take away sins. But when Christ had offered for all time a single sacrifice for sins, he sat down at the right hand of God, waiting from that time until his enemies should be made a footstool for his feet. For by a single offering he has perfected for all time those who are being sanctified. Because no one CAN make themselves worthy, therefore, no one is REQUIRED to make themselves worthy. We must receive salvation as it is, a free gift, with no attention to our own worthiness whatsoever. Christ does not save worthy people, He saves sinners, condemned and unclean and in no wise capable of making themselves worthy of His gift. So the problem at the time of the Reformation was that people were brought into a slavish system of humanly invented rites, ceremonies, rules, regulations and requirements in order to finally help make themselves worthy of eternal justification. Which would still be followed by indeterminate periods of time in the afterlife in Purgatory, still paying for their own sins until the debt was fully discharged. Today, the landscape is far different, but the need to be called back to Sola Gratia all the more necessary. Not because people are so worried about making themselves fully worthy of final salvation – but because in our culture at least – people already judge themselves worthy – and so do not NEED to depend upon God’s grace in Christ alone. After all – we’re all pretty good! We DESERVE nothing but the best. God actually owes it to us in some respect. We DO merit it. In this generation of self-esteem and the celebration of human accomplishment, the idea that we are very worthy beings is drilled into us from almost every corner and that from birth. Believer – Once in Christ, and we fail and commit sin, our tendency still is to try in some way to redeem ourselves in God’s eyes afterword. It is a fool’s errand. We cannot do it. If we’ve sinned against other people, we need to make it right with them as best we can. But in terms of having sinned against God – we must cast ourselves back on grace and grace alone, and rest there. Of course we repent and turn away from our sin anew – but we cannot somehow make up for sin in God’s eyes. Here, by faith, we look once again to the cross, and trust in His unmerited and free grace. We cannot merit forgiveness after we’ve come to Christ, any more than we could before we first came. We stand in this grace as Rom. 5 puts it – always. Unbeliever – Beloved, there is only one way you can be saved from your sin – and that is to come to Christ guilty, condemned, unclean and in need of the free gift of His grace in Jesus Christ. If you will not condemn yourself so as to receive His forgiveness and imputed righteousness today, then He will condemn you on the last day, and to an eternal condemnation from which there is no escape or hope of deliverance. Come today to the Christ who justifies the wicked. He alone is sufficient for your sin. If the Spirit is convicting you of your sin today, so that you long to be forgiven and reconciled to God – come and by His grace be justified by placing your entire trust in the finished work of Christ at Calvary – and not in any intrinsic merit you think you have, nor any you can somehow earn. If this is you, any one of the elders here would be more than happy to spend some time with you right now to talk with you pray with you that you might be born again. Alan Cairns, Dictionary of Theological Terms (Belfast; Greenville, SC: Ambassador Emerald International, 2002), 422.